The shoulder season between Tahoe’s summer and winter seasons is described by many as the best time of the year to explore the region. The calendar is laden with activities, the water is just as warm as it is in the peak of the summer, and the views are perhaps the most spectacular that you’ll find year-round. Over the next two months we’ll be sharing our favorite #TahoeTop10 activities to enjoy during the late summer and early autumn months. Follow the North Lake Tahoe blog and @TahoeNorth on Instagram for inspiration, and plan your trip to the north shore. Seek out reggae, classical, pop and acoustic music drifting through the trees at Tahoe High Notes concerts and festivals hosted around North Lake Tahoe. These free events last through early September. Highlights include Peaks & Paws (a dog-friendly concert that benefits the Humane Society of Tahoe-Truckee), a craft beer tasting foam fest, the 28th Annual Wine Festival in Squaw Valley, and Guitar Strings vs. Chicken Wings. Grab a seasonal brew and plot out a Tahoe adventure that takes you from Homewood to Chimney Beach, and everywhere in-between. North Lake Tahoe Ale Trail activities can be found on an interactive map that points out hot spots around the beaches and peaks of the north shore to indulge in a beer, launch off a kayak or summit a peak. As autumn begins to set in but the weather remains warm in the daytime, the Tahoe landscape becomes ideal for stunning photography. Watch for the soft lighting in the morning and late afternoons. Nightly, as the sun sets, catch the Alpenglow across the horizon. Later in the evening, above Incline Village is prime Milky Way season for photographers in pursuit of dark light. North Lake Tahoe’s mountain resorts offer exquisite views of sunrises and sunsets. There are multiple vantage points at hiking trails around the area with breathtaking views. As the heat begins to beat back, the late summer months and early fall are ideal to break a sweat on one of the many mountain biking trails in the Sierras. There tends to be less traffic along the trail, and changing aspens add a tranquil element to your ride. Dog-friendly parks, trails and beaches can be found around North Lake Tahoe. Grab a tennis ball, some fresh water, a leash, a few doggy bags, and of course, your canine, and discover what makes North Lake Tahoe a pup’s playground. Lodging for you and your furry friend is available at cabins, inns and lodges around the region – an alternative to kennel boarding that both you and your pup can agree on. On a perfect day, you can peer as deep as 70 feet down into the glacier-fed depths of Lake Tahoe from paddleboard or kayak. Plan on spending a morning atop the lake, when the winds are still low, and the lake is at its smoothest. As late-summer mornings can be chilly, it’s never a bad idea to bring along a wetsuit. For a full list of paddle shops and points of interest, check out the Lake Tahoe Water Trail. It is said the alpenglow following a Tahoe sunset is unlike any other in the world. Just as the sun dips below the horizon in the west, the mountains opposite the sunset blaze in a ring of red and purple. Choose your vantage point, and bring a camera to capture this unique phenomenon. Food heaven can be found on practically any of the outdoor patios on the lakeshore and deeper into the mountains in resort towns. Chillier nights bring fewer bugs, while heat lamps on restaurant decks keep you in warm comfort as you’re catching a Tahoe sunset. Thrill-seekers are still carving trails into Tahoe’s water during this time of the year. Whether it’s parasailing, water skiing, tubing, or just boating, bring your wetsuit and life vest for the time of your life. Watercrafts can be rented at various destinations around North Lake Tahoe. 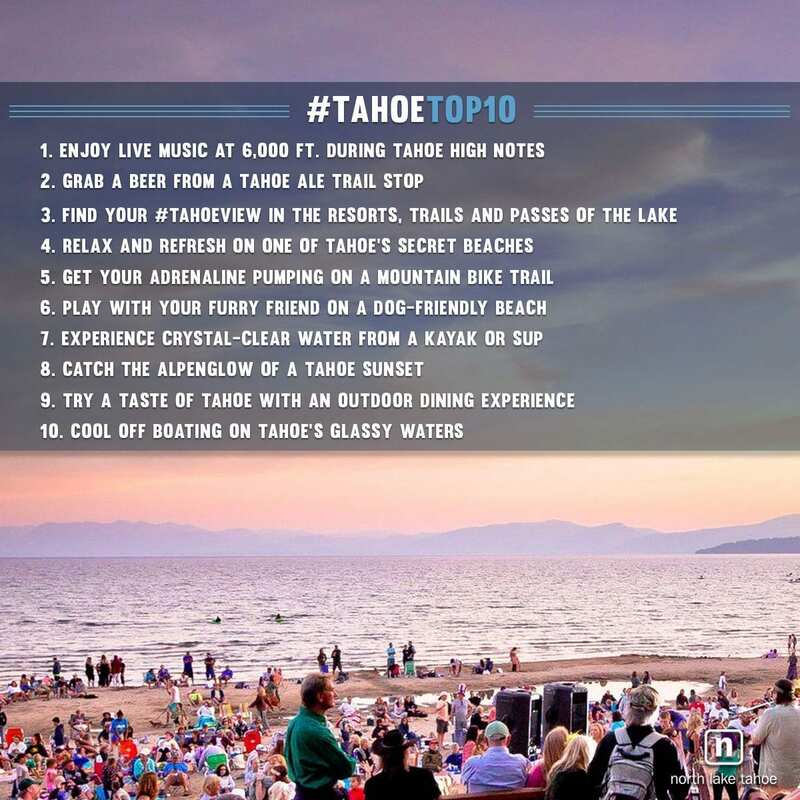 The post 10 Must-Dos While Tahoe is Still Warm appeared first on Go Tahoe North.